Our excellent Medical Gases Area Valve Box is offered to the esteemed clients at highly competitive prices. The AVSU is centrally located and has multi gas isolation units with integral alarm. Moreover, the products offered by us provide control of all gases or services efficiently. These valve boxes are widely appreciated by the clients for their durable standards, perfect shape & design and easy installation. With the help of our wide distribution network, we timely deliver the ordered products at the clients' end. 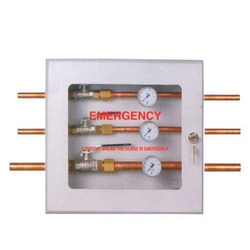 We are one of the renowned names of the industry engaged in offering Area Valve Box to the clients. These boxes are used to supervise and shut individual as well as parts of central systems in hospitals and laboratories. Moreover, these products allow the ward staff to isolate the area for maintenance and other repairing works. Valve box made using M.S.